Young Hawaiian girl Lilo and her “dog” Stitch—actually a dangerous extra-terrestrial fugitive—invite you to hang around the Pizza Oom Mow Mow patio area for Lilo & Stitchs Ohana Luau. Aloha! Welcome to Lilo & Stitchs Ohana Luau. 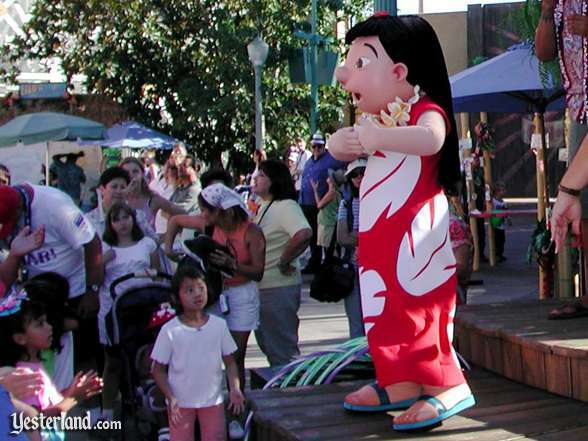 What are Hawai‘i residents Lilo and Stitch doing in a park whose theme is California? The official story is that theyre taking a California vacation. They brought their Ohana Luau along, complete with the hula and the limbo. Of course, Lilo brought her favorite Elvis Presley songs. Pizza Oom Mow Mow, a California surf culture-themed counter-service restaurant with indoor and outdoor seating, is the most Hawaiian part of California Adventure. After all, the states surf culture was imported from Hawai‘i. Gather around for live music and dance. On a specially built stage, The stars of the animated feature, along with Hawaiian drummers and tropically-attired hosts and hostesses, take turns entertaining guests. “Ohana” means family, so there are plenty of family activities. Enjoy games, such as Lilo’s “Hang Loose, Man!,” a Hawaiian-themed “hangman” game. Take hula lessons. Do the limbo. Try to win a hula-hoop contest. Kids can come right up to the edge of the stage. Theres more for kids than just watching the performers and interacting with them. Kids can create Hawaiian-themed souvenirs at the “ArtsVenture” activity area. Hawaiian-garbed Cast Members show kids how to make and decorate miniature surfboards, paper orchids, and ti leaf bracelets and anklets. Does Lilo see a parade approaching? The Ohana Luau goes on almost continuously for seven and one half hours every day. The only pause is when Eureka! The California Adventure Parade passes by each afternoon. Meet Stitch at Lilos Photo Hut. If youve seen the film Lilo & Stitch, you know that Lilo was an avid photographer. 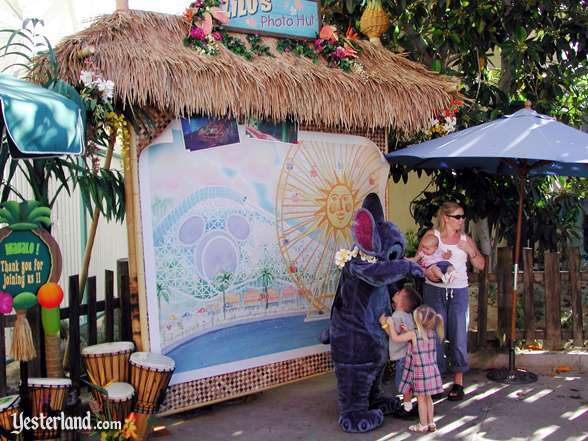 So visit Lilos Photo Hut adjacent to the Lilo & Stitchs Ohana Luau for a photo with Stitch. Perhaps Lilo will come over too. Step inside for some pineapple and ham-topped pizza. Whats a luau without food? Dont worry. There are some special island-style menu items at Pizza Oom Mow Mow. How about pineapple and ham-topped pizza? Maybe youd prefer pineapple-banana shortcakes. Quench your thirst with Hawaiian specialty drinks. 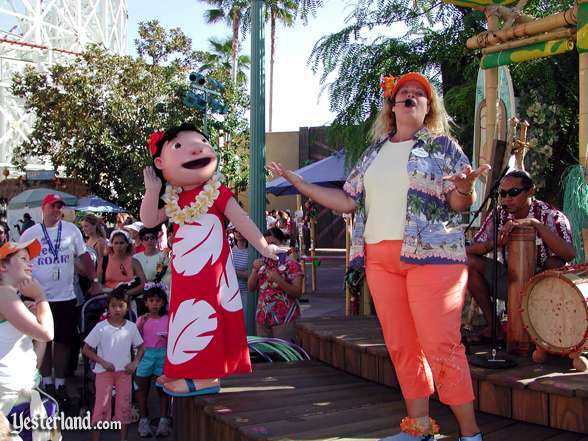 If you sit outdoors, youll enjoy the music from Lilo & Stitchs Ohana Luau. If you prefer to sit indoors, Pizza Oom Mow has new background music in honor of the luau. Listen to Elvis tunes, such as Elvis’ original recordings of “Blue Hawaii” and “Rock-A-Hula Baby.” How about “Burnin’ Love” performed by Wynonna Judd and “Cant Help Falling In Love” performed by the A*Teens from the Lilo & Stitch soundtrack? Annette Funicello fans will enjoy “Pineapple Princess” and other Hawaiian-themed classics by Annette. Lilo wears boots that look like bare feet in sandals. Theres Lilo & Stitch merchandise available nearby. Alas, you cant buy boots like the ones that Lilo wears. Wouldnt you like boots that have molded plastic toes? If you live in a northern climate, just think of the looks youd get trudging through the snow. Lilo & Stitch, the traditionally animated feature from Walt Disney Feature Animation Florida, opened in U.S. movie theaters on June 21, 2002. The same day, Lilo & Stitchs Ohana Luau opened adjacent to the Pizza Oom Mow Mow outdoor patio at Disneys California Adventure park. The Ohana Luau ran daily through September 30, 2002. Guests who expected something resembling an actual Hawaiian luau or a big movie tie-in show, along the lines of The Spirit of Pocahontas, were disappointed. The Ohana Luau was small-scale entertainment. But other guests—especially those with young children—who came upon the festivities while walking around the Paradise Pier Lagoon enjoyed the energetic performers, the activities for children, and the opportunity for a picture with Stitch. 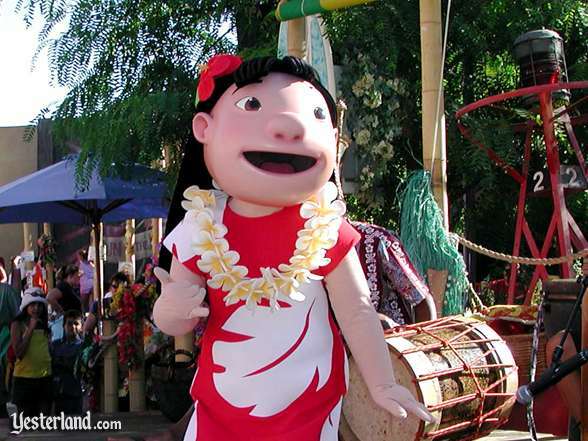 In summer 2002, the Ohana Luau was the only location at the Disneyland Resort at which the Lilo and Stitch characters appeared. Any guests looking for a “meet and greet” with the popular stars of the successful 2002 animated feature had to visit Disneyland Parks less popular neighbor. 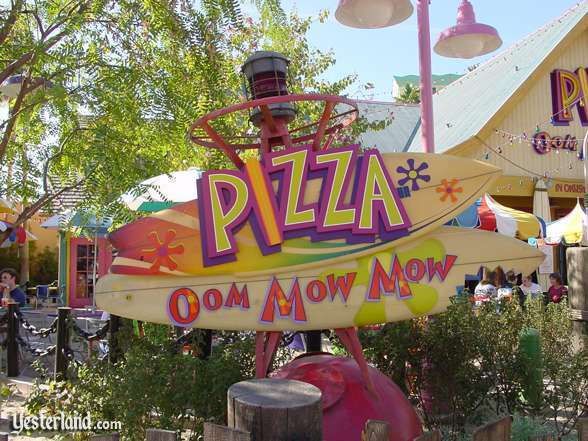 Pizza Oom Mow Mow opened in February 2001 as one of the original eateries of Disneys California Adventure. It closed permanently in September 2010, as part of California Adventures billion dollar makeover. 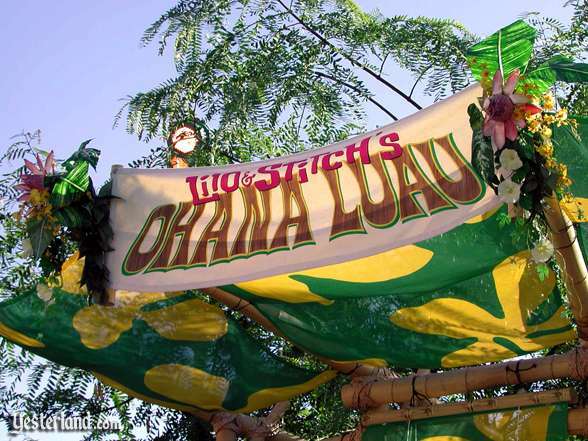 Photograph of Lilo & Stitchs Ohana Luau banner: 2002 by Werner Weiss. Photograph of Lilo & Stitchs Ohana Luau Lilo and hostess: 2002 by Werner Weiss. Photograph of Lilo & Stitchs Ohana Luau Lilo and audience: 2002 by Werner Weiss. 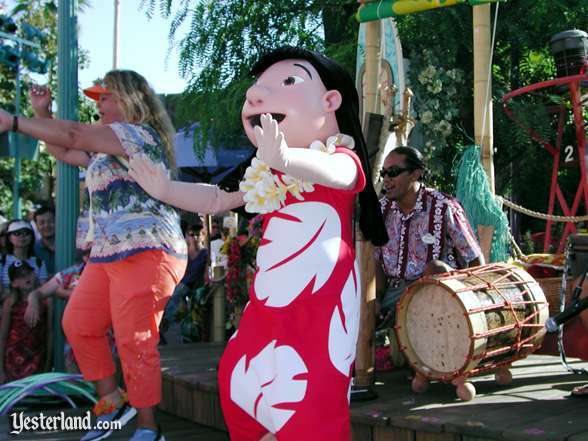 Photograph of Lilo & Stitchs Ohana Luau Lilo dancing with hostess: 2002 by Werner Weiss. 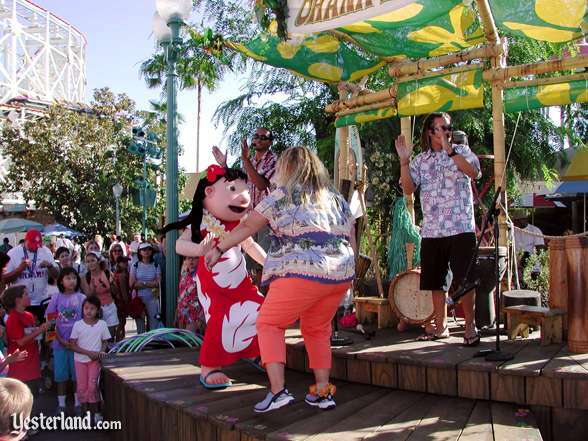 Photograph of Lilo & Stitchs Ohana Luau hula lesson: 2002 by Werner Weiss. 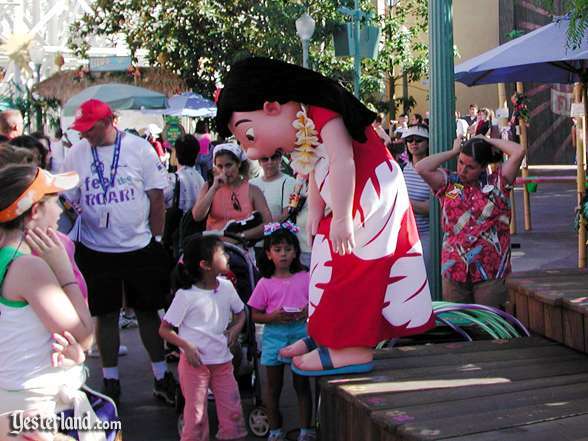 Photograph of Lilo & Stitchs Ohana Luau Lilo at edge of stage: 2002 by Werner Weiss. Photograph of Lilo & Stitchs Ohana Luau Lilo: 2002 by Werner Weiss. Photograph of Lilo & Stitchs Ohana Luau Lilos Photo Hut: 2002 by Werner Weiss. Photograph of Pizza Oom Mow Mow sign: 2002 by Allen Huffman. 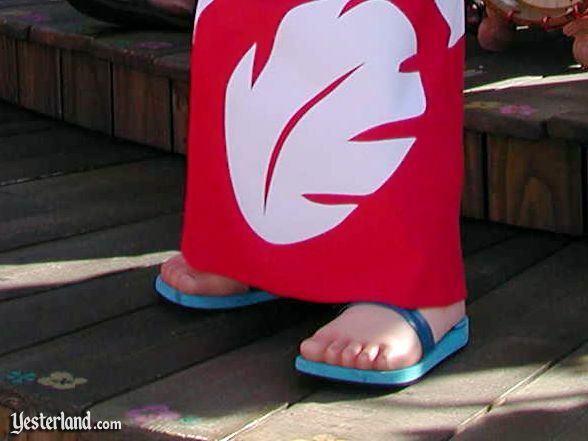 Photograph of Lilo & Stitchs Ohana Luau Lilos feet: 2002 by Werner Weiss.